Michigan Gov. Rick Snyder, left, talks with New Jersey Gov. Chris Christie. No one is winning the Republican presidential primary right now. In fact, there isn’t even a top tier in the endorsement primary, and the lack of a leader has led many Republicans to consider running. The latest is Michigan Gov. Rick Snyder. While we’ll get into more details about Snyder’s chances if he eventually declares, Snyder’s candidacy does not look on first glance particularly attractive for Republican primary voters. He has two things working against him: ideology and electability. Snyder is likely too moderate for Republican primary voters. He is anti-abortion, but he vetoed a bill requiring secondary insurance for abortions. He is against gay marriage, though his record is, again, mixed. He has tried to simplify the tax code, yet he has also raised taxes. Snyder also signed a bill expanding Medicaid coverage. Using our aggregated ideological scale that takes into account congressional voting records (inapplicable to Snyder), fundraising, and public issue statements, Snyder is to the left of everyone in the Republican field save New Jersey Gov. Chris Christie. 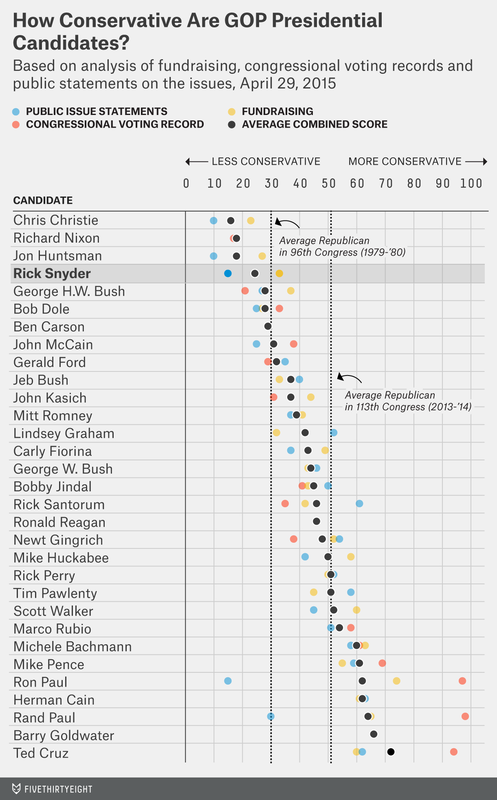 In fact, Snyder is closer ideologically to Christie and Jon Huntsman than he is to Jeb Bush. That’s a pretty big deal given that polling shows both that Bush is barely thought of as ideologically acceptable to Republican primary voters and that Christie is too far to the left. Christie’s candidacy, of course, is nearly dead. How could someone who is ideologically close to Christie possibly win the nomination? Perhaps, Snyder is planning on making a compelling electability argument? Remember when Christie was the toast of the town after his dominant re-election as New Jersey governor in 2013 and before Bridgegate? Moderate candidates (though more conservative than Snyder) won the last two Republican nominations because they were thought to have the best chance of winning in the fall. Snyder doesn’t fit the bill, though. 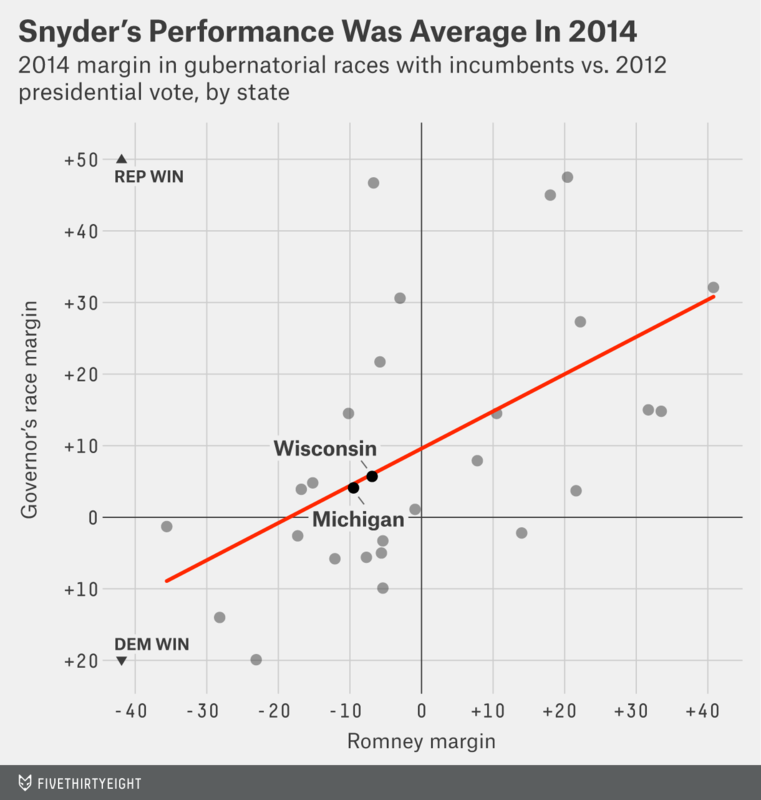 Snyder was re-elected governor in 2014 by a measly 4-percentage-point margin. As you see in this chart of incumbent governors’ re-election margins in 2014, Snyder performed about how a Republican governor of Michigan would be expected to given the national political environment in 2014. He’s about as electable as Wisconsin Gov. Scott Walker, but Walker is far more conservative. What’s the rationale for most Republican primary voters for choosing Snyder over Walker? Nor is it clear that Snyder would have extra appeal with Latinos, a group that Republicans are chasing, or white voters without a college education, a group that has been trending Republican. Michigan, like every Midwestern state outside of Illinois, has a small Latino population. And Snyder did no better (and compared to Ohio Gov. John Kasich, far worse) among whites without a college education than the four other Midwestern Republican governors who were elected in 2014. Snyder may argue that he will deliver Michigan and its 16 electoral votes to the Republican column in 2016. He’s perfectly free to make that argument, but Michigan is a fairly blue state in presidential elections. No Republican presidential candidate has won it since 1988, and it was about 6 percentage points more left-leaning than the nation overall in 2012. That’s greater than the average home state presidential advantage over the past 30 years. This is a very volatile Republican field, and Snyder shouldn’t be written off. It’s just not clear what he has to offer Republican primary voters.